Atlanta Post Caps is an American owned and operated company in business for over 10 years. Atlanta Post Caps labeled products are manufactured in U.S.A.. We have distributed millions of post caps worldwide out of our main warehouse in Tucker, Georgia. 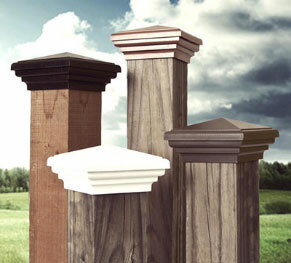 Our patented fence post caps are not only the most reasonably priced on the market, but we guarantee they will outlast and out perform any wooden products on the market; and we back that up with a 10 year guarantee against fading, warping and discoloration. No wood products can make the same claim. We are the proud manufacturers of the only patented fence post cap on the market, and the first choice by many fence and deck professionals. We can help with design, color selection, and troubleshooting. We keep all of our post caps in stock and usually ship within 24 hours of purchase, and often ship the same day. If our post caps don't suit your needs for any reason, you can send them back for a full refund! customerservice@atlantapostcaps.com or by phone at (770) 808-0200. Are you a business looking to expand your product line? Contact us about drop-shipping and wholesale opportunities.